Are You Aching for Help with Tooth Pain? 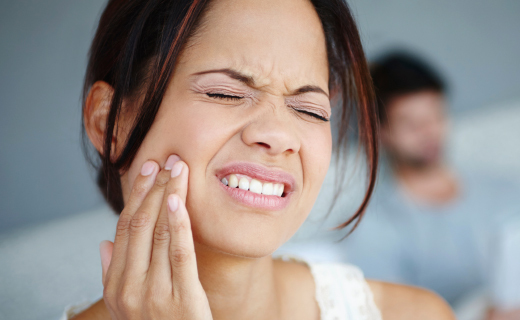 There are many types of tooth pain, from subtle sensitivity to lingering long-term agony. But you don’t have to take the ache any longer. To find the ideal treatment for teeth, it’s important to know if the pain is caused by decay, infection or injury. To help you understand your symptoms and know the best ways to soothe them, we’ve put together this helpful guide to help you ease the pain. Try toothpastes made for sensitive teeth. Brush with a soft brush and a gentle touch. Only brush with an up-and-down motion since brushing sideways can wear away exposed root surfaces. Visit a dental clinic if these tips don’t treat the trouble. If you’ve recently had dental work, you may experience sensitivity. Dental work can irritate the pulp inside of the tooth, causing temporary sensitivity to extremes in temperature. Try waiting for two to four weeks to see if the pain passes. If the sensitivity stays, visit a dental clinic to get to the root of the problem. This may be caused by tooth decay, a crack in the tooth, or simply a loose filling. Yet it can also come from deep damage to the tooth’s tissue. Find a dentist in Virginia to get an expert opinion. You may be referred to a specialist called an endodontist if the problem is caused by tissue damage. The endodontist will most likely perform a root canal to remove the damaged tissue and eliminate the ache. When your teeth are causing this type of trouble, the problem may be an abscessed tooth that has caused an infection in the bone and tissue. Go to a dentist in Virginia for treatment options to save the tooth. You may be referred to an endodontist if you need the care of a specialist. Take over-the-counter medications to relieve any pain until your appointment with the endodontist. You may need to blame bruxism, which is the grinding of the teeth. Yet this can also be caused by a sinus headache, which is felt in the face and teeth. Find a dentist in Virginia if you tend to grind your teeth to discuss the treatments for bruxism. Sinus headache sufferers can try over-the-counter medication, but should go to a specialist if the pain is a chronic problem. Staffs and doctors kind explanation.